We all get a Beacon Hill Pat-On-The-Head and pinch-on-the-cheeks today! Your progressive reps — for the most part — decided to extend the Speaker’s power, voting down term limits for Speaker, and to continue undemocratic, opaque processes that take power out of their own hands, and empower the Speaker and lobbyists. One hand giveth, the other taketh away: Your progressive reps can stand up and call for good legislation, and on the other hand they don’t pass the process reforms that make substantive reforms — their campaign promises! — possible. They want credit for supporting Good Things, but maybe they don’t want to actually have to pass them. I told him that a coalition of groups had polled members of the House and we knew that a sizeable majority of the members supported our bill. And who can possibly know? The lack of transparency is what allows these games to continue. Is your progressive rep committed to real legislation passing, or just two-faced virtue-signaling to keep the activists assured that I’m really on your side? And if not these reforms, then what? Are your progressive reps claiming that everything works well as it is? What’s next? 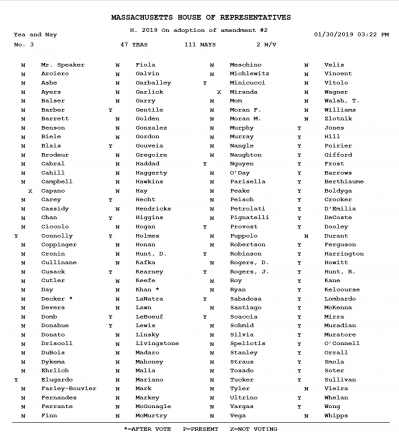 ProgressiveMass has the roll call and commentary on the three amendments from Rep. Jon Hecht. To tot up those examples whom I mentioned previously: Balser, Barber, Decker, Ehrlich, Garballey, Rogers were all no’s — as was our friend Tommy Vitolo. Denise Provost was a Yes. 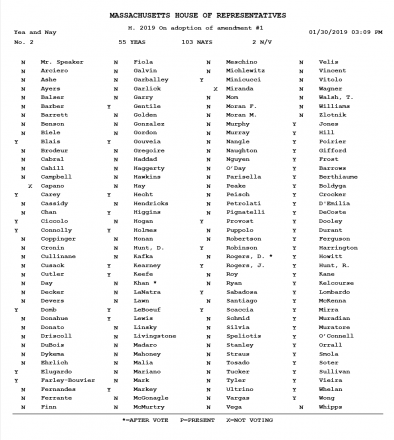 MA House roll call – amendment would provide 72 hours to read a bill before a vote. … The second amendment would have ensured that reps have 30 minutes to read any amendment filed on the floor before having to vote on it. It was voted down 47 to 111. This amendment would provide for 30 minutes (!!!) to read an amendment before voting. … Finally, the third amendment would have required the publication of hearing testimony (for/against a bill) and any roll call vote taken in committee. It was voted down 49-109. 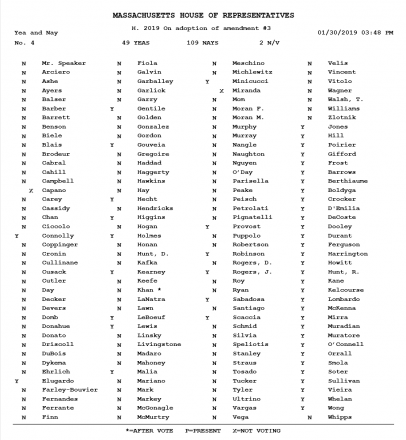 This amendment would require hearing testimony to be published.